Leaning or bowing basement walls are a sure sign of foundation failure. This foundation problem generally occurs when the foundation of a home has begun to shift due to excess pressure in the ground. Excess groundwater can put a huge amount of stress on the soil around a home, causing even such a heavy weight to feel the strain. The basement walls will begin to bow or lean as the pressure pushes against the walls. Not only will this cause problems with your walls, but other problems with your foundation will become apparent. It is essential to the stability of your home that you correct bowing or leaning foundation walls to prevent them from getting worse or from falling in. Helical Tie Back anchors are needed for this repair, and Anglin’s Foundation & Masonry Repairs has the experience and expertise needed to secure your home. Helical tie backs are large, screw like implements that are screwed into the soil adjacent to the affected wall. The anchors are attached to the interior of the wall, applying tension to straighten the wall and keep it from bowing in the future. Once the installation is complete, the hole on the inside wall is sealed. 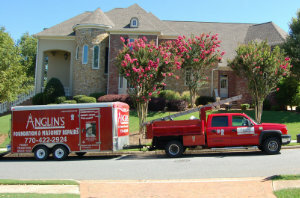 While this is a very advanced method of repairing severe foundational damage, Anglin’s Foundation & Masonry Repairs is your trusted source. If you have any signs of bowing, leaning, or rotating basement walls, contact us immediately.